Geri Ann Glasco: The Next Babe Ruth? Geri Ann Glasco is the rare ball player than can hit and pitch equally well. Yankee great, Babe Ruth could do both, but even he had to stop pitching to concentrate on his hitting. Glasco one-ups the all-time great by performing both roles at the same time. Against Utah Valley, Glasco allowed only three hits in a run-rule shortened 9-1 victory. 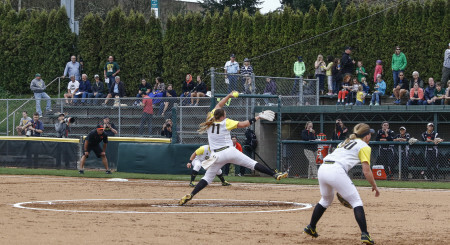 The junior right-hander helped her own cause by doubling in Janie Takeda in the first inning of the first game and in the second game of the double header, she hit a homer to spark the Ducks to a 3-0 record. For the season, Glasco holds a perfect 6-0 record as a pitcher and averages a cool .339 as a switch hitter. Expect that average to climb as the season progresses. She’s batting 4 for 4 with a pair of RBI’s for the three games this week. One might wonder why the 2012 Gatorade National Player of the Year left Georgia after two years of stellar play and journeyed to rainy Oregon. No secret there: Glasco has come to learn from Oregon’s head coach and pitching guru Mike White, one of the best fast-pitch hurlers of all time.White emphasizes that his pitchers paint the corners. Glasco is learning her lessons well. After the Utah State double-header she said about her pitching, “I was a little shaky in the beginning, but settled down and started hitting my spots.” As for her strength as a pitcher, she said “changing speeds is what I’m good at.” Good indeed; she fanned 10 Wolverines in the win against Utah State. Of his star, White said that she is recovering well from an injury. “She’s getting stronger week by week,” he reported. That week-to-week growth will be vital down the stretch. Oregon holds a perfect conference record in the early part of the Pac-12 regular, but White needs Glasco to develop both as a hitter and a pitcher if he and his team are to reach Oklahoma City and the College World Series again this year. After the Utah State games, White declined to name his number two pitcher, but Glasco has to be high on his list. PERFECT GAME ALERT: FishDuck.com would like to congratulate Cheridan Hawkins on her first career perfect game in the tilt against the Washington Huskies Friday. 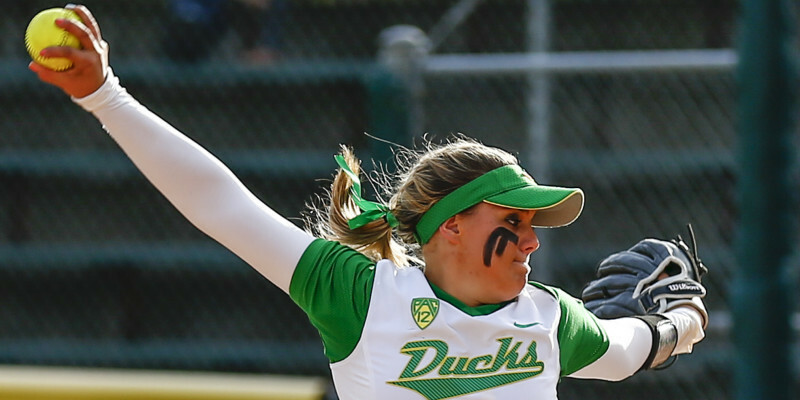 This victory was her fifth no-hitter at Oregon and perhaps the sweetest so far. The series against the Huskies continues today at Howe Field.